We love Plus Plus building blocks, if you have never heard about it definitely check the Plus Plus Facebook Page , or the hastag #TTPlusPlus for ideas. We also have a Plus Plus challenge page where we group all the Plus Plus reviews, competitions and challenges! Not to forget our Pinterest Page for more inspiration. Often people ask: another type of building toy, really? Well in our opinion Plus Plus is very versatile, you can build 2D and 3D, babies and toddlers can start playing with it as soon as they stop mouthing. At first they just use them as tactile to glide to their fingers (+-18m), they can sort them per color (+- 20m), there is something about them that attracts little people. It enhances their motor skills as they learn to puzzle them (+-24m) and encourages imagination. eg our little one will make a fairly linear ‘composition’ and call it a snake. She will then continue to play with the snake before making something else. A brown blurp with white becomes a cow, and even though without her telling me what it is, it looks by far more what she intended it to be, then if she would have made a drawing. If you compare it to regular Lego: it is just as addictive, you always want more building blocks, but the main benefit is that kids can start to play with it sooner, as it clicks together easier, and can be manipulated by younger children. PlusPlus is PVC, phtalates and BPA free. It is free from harmful substances and made from PE, which is often also used in food packaging. Lego is made from ABS plastic, which has always been a plastic that is avoided by governments to do tests on in regards to harmful substances and the toxicity of the production process. On the internet I have not found decent documentation pro or con ABS plastic that I would dare to trust (please do leave a reply if you would have trusted links for us). A bonus for the planet: it is manufactured in Scandinavia and hence travels less distance then Lego made in China, and has higher production standards to adhere to. Price wise: we blieve the price point is very good if you calculate price/building unit. But obviously Lego has it’s advantages of having more small world play abilities after building up, due to characters etc. 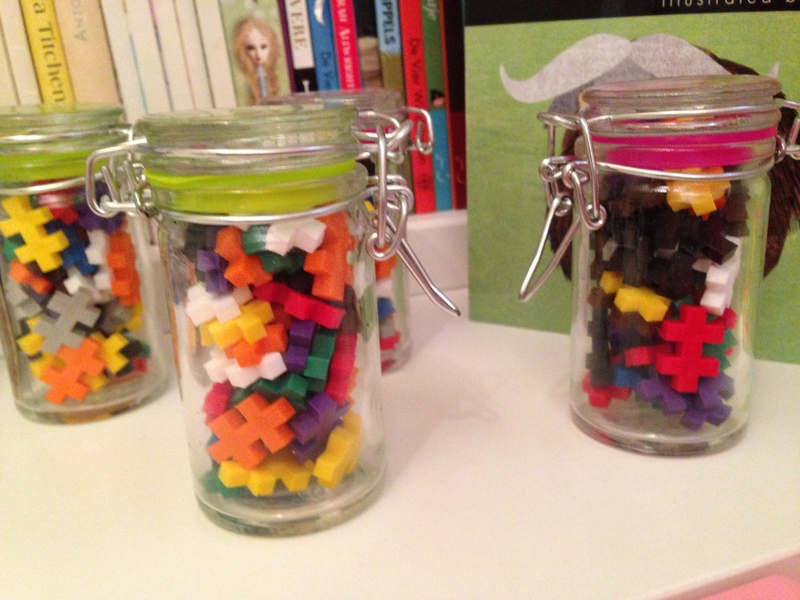 I would also go as far as to say that with Plus Plus position falls in between Lego and Hama Beads. You build up creations in a similar way as to Hama Beads, but PlusPlus sticks together as is, and does not need to be ironed, hence it can be re-used afterwards. 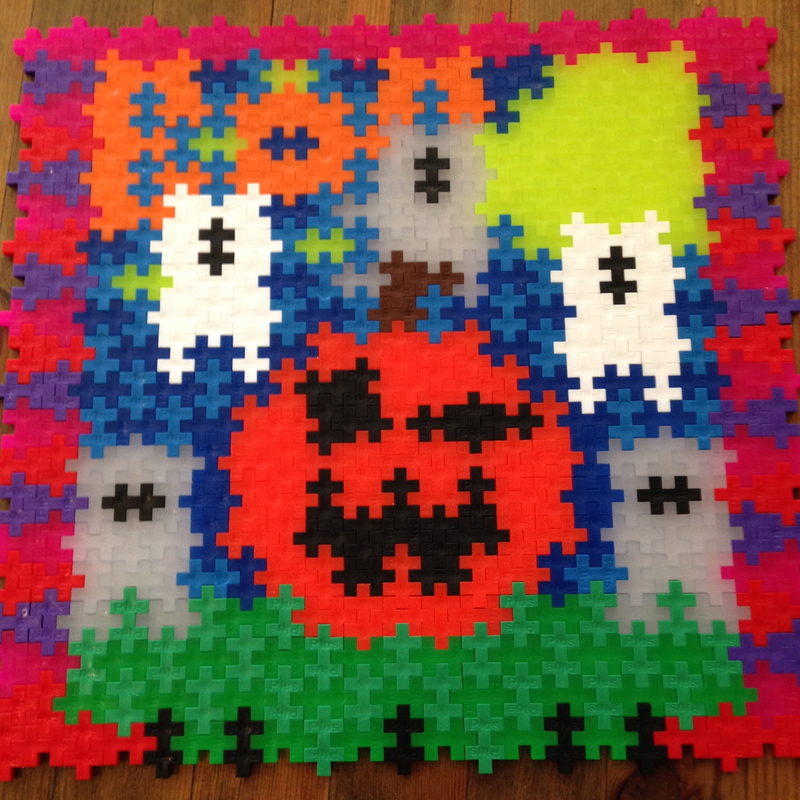 But how one builds and develops a 2D image is much more similar to Hama Beads then everything else I encountered. Plus Plus is not only for children, most of the parents we have send Plus Plus to test, admitted they’ve had a play, or got requests from the kids to make something, I have found it quite addictive and love the fact that it’s an activity I can do with my toddler. We do take Plus Plus everywhere with us, and yes it does end up under the table but I do very much prefer a quiet and happy toddler then one that is bored and get grumpy and load. As we are all boxed up and ready to move, their is little space for us to do arts and crafts or messy play at the moment, hence PlusPlus has been our saviour for adding some creativity to themed play. Hereby a sneak preview of our Halloween builds! I often get a lovely nostalgic feeling when playing. I was lucky enough (looking back now) that I enjoyed a Steiner Education, and one of the things I remember now is we were always encouraged to build up a drawing, and develop the shape of the item in mind by colouring. So against the standard of first drawing the outer lines and then filling up. I have done a quick google on the exact terminology and purpose of this specific chalkboard Waldorf drawing technique, but could not find it. My intuition tells me it could have something to do with feeling from within rather to judging on outer shape. And with Plus Plus you build it up block by block, not by doing the outer lines first. From the beginning I have been doing lot’s of mandala’s and colour combinations and schemes. My little bit of OCD would flare up as I was always forcing myself to make symmetrical items and using all my bricks. As you can see here, with PlusPlus 2D less is often more. For adults it is just great to shut off and get absorbed in something. Therapeutic is the word that comes to mind. Not sure if Rudolf Steiner would agree with Mandala’s in plastic, but my drawing skills were always seriously lacking! But then – in my defence- I do put it to good use to make themed seasonal decoration in the house? Our overall message: we do love Plus Plus, it gets played with daily. Yes there are lot’s of tiny pieces, but our own little one does not mind tidying up, and it does tidy up very very quickly. You can use any container you like to store your Plus Plus. We truly recommend PlusPlus packages between 5 and 10 pound as a stocking filler or for birthday gift for school friends and even split up into party bag fillers as per the picture. They are original, you can find packages suiting everyone’s budget, and not once I have heard of a customer who was not pleasantly surprised with the play value of their purchase. For more info on Plus Plus and non-toxic plastics read previous posts about BPA free toys, PVC free toys and phtalates free. Plus Plus party bag fillers example in bottles purchased at Tiger. I thin Plus Plus is a great stockingfiller for just about any age of child or young person. It is very therapeutic and calming, it’s great for young people with autism as it allows them to express themselves in which ever way they are able or wish to do so, and as you say, if you are a little drawn to symmetry then you can go right ahead in a way that is much harder with Lego.